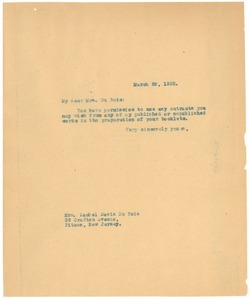 New York (N.Y.) - Concerning permission to use extracts of three articles of Du Bois's for use with a text book that DuBois is working on. Baltimore (Md.) - Looking forward to his impending visit and describing the current "rainy spell." 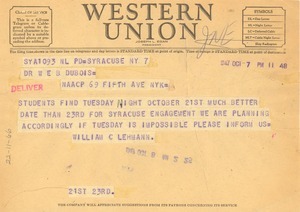 Syracuse (N.Y.) - Sent by William C. Lehmann; requesting to change the date of his impending visit to the University from October 23 to 21, as "students find Tuesday night much better." 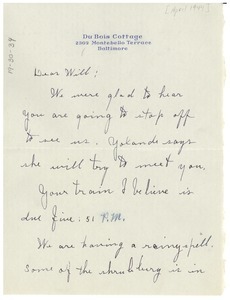 Verso bears pencilled drafts of Du Bois's compliant reply (relayed in mums312-b115-i452). 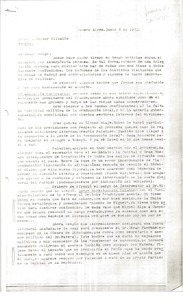 Buenos Aires (Argentina) - Mostly letters from Perón, but also includes a letter from Oscar Albrieu to Hector Villalón and a letter from Lanusse to Pandolfi. Letters discuss the military government and the Peronist movement during the upcoming elections. 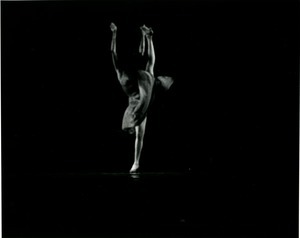 Massachusetts - From a series of photographs depicting a performance of "Turn On To Mangione," choreographed by Richard Jones. 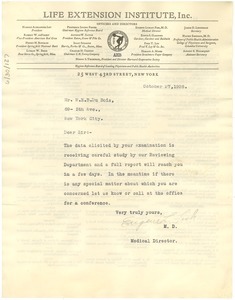 New York (N.Y.) - Concerning evaluation of data collected at recent examination. 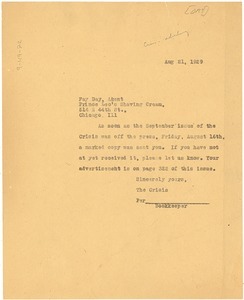 New York (N.Y.) - Explaining that The Crisis sent a copy of the September issue, containing her advertisement, to Day. Asking to be informed if she did not receive it. 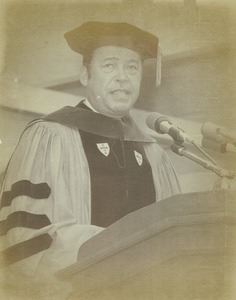 Edward Brooke, commencement speaker, standing behind podium, 1971. 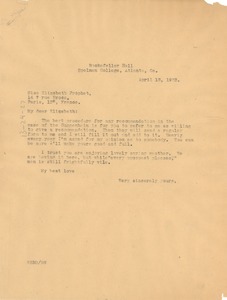 Atlanta (Ga.) - Regarding her request for a letter of recommendation (see mums312-b067-i343), suggesting that she name him in her application, and let the Guggenheim Foundation get in touch at their leisure.